When I cooked for guests last weekend, I checked one of Nigella’s cookbooks I have at home (slightly damaged by a flooding three years ago, but still functional) to get some inspiration. Her love for entertaining is famous and I knew I might find something interesting that can be converted into a nutritious lectin-free dish. And I did: her New Orleans Coleslaw looked exactly like what I needed for this event. 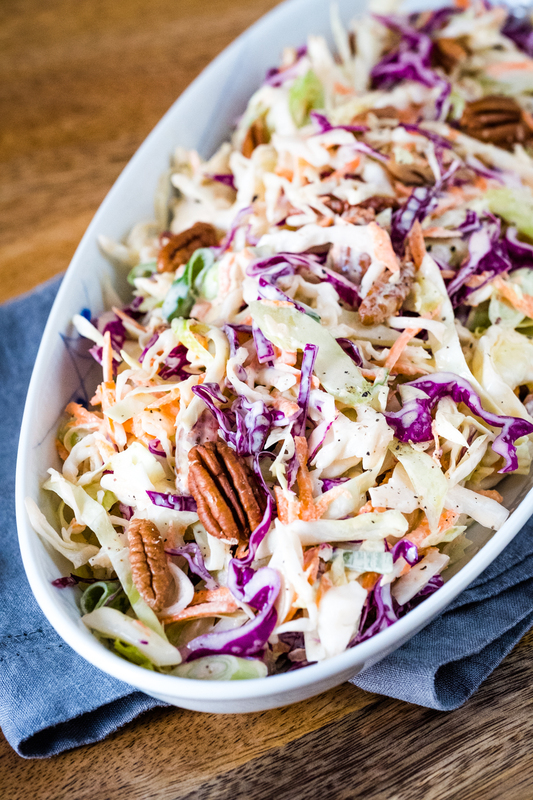 This is as easy to make as a traditional coleslaw, but it has much more flavor and nutrition. The original recipe included maple syrup and buttermilk, both not Plant Paradox compliant, but I knew it would be as good without. 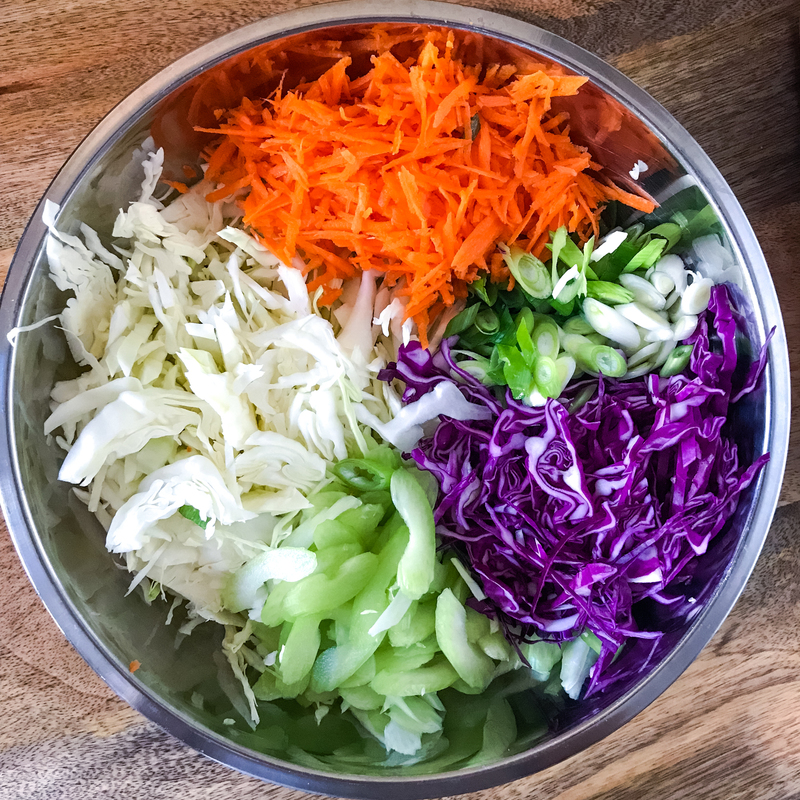 I think is a great dish to prepare with kids, because it has all the colorful ingredients and vegetables that children usually are familiar with and like: cabbage, both green and purple, carrots, celery, green onions plus pecans. 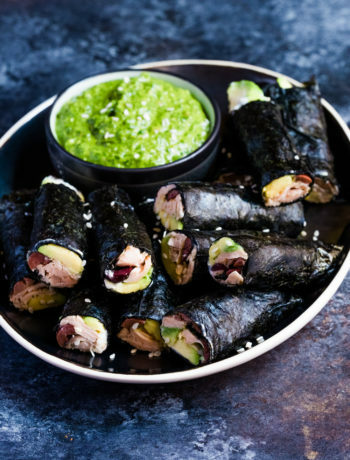 It’s also great for making in advance and having it for a workday lunch next day, by itself or adding some protein next to it. 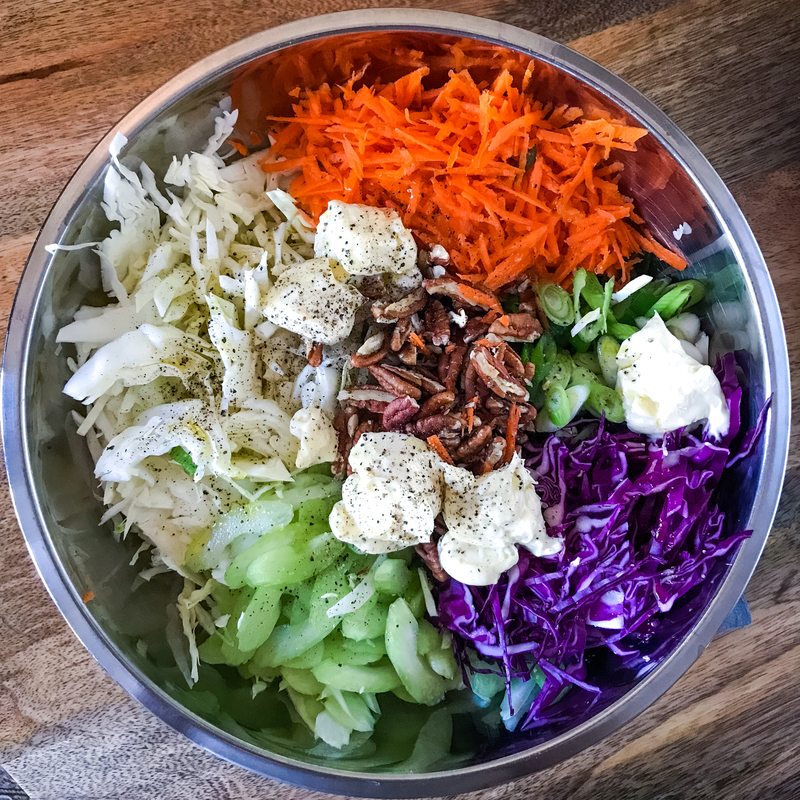 We ate it two ways, once as a side dish or simple, vegetarian salad and half of it we mixed it with the last leftovers of our turkey (some breast meat) and make a turkey / coleslaw salad that tasted amazing. Added some more extra virgin olive oil when serving for more Omega-3s. This was the half mixed with turkey, that went into a glass container and stored for future meals. As per the mayonnaise, I used the only Plant Paradox compliant mayonnaise, as far as I know, Primal Kitchen Avocado Mayo. A home made mayo would be even better, but sometimes I go with convenience (and I have to say, it tastes pretty great too). If you don’t do eggs, I would recommend having this salad with more extra virgin olive oil, eventually mixed with some goat yogurt or almond cream cheese. I recommend buying raw pecans and roast them slightly, nut oils are highly susceptible to oxidation so is better you control the process at home. They taste much better too. 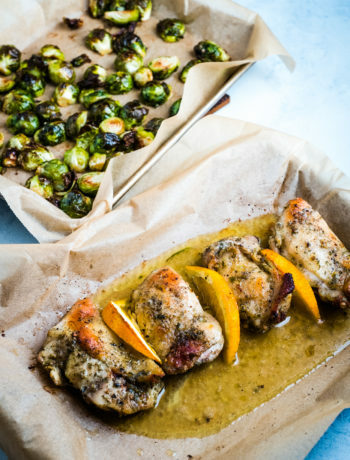 An easy, packed with nutrition and delicious lectin-free side dish. Roast the pecans for about 8 minutes at 350F. Prepare all the veggies and mix them with the rest of the ingredients. Taste and add more mayo, apple cider vinegar if needed and adjust for salt and pepper. 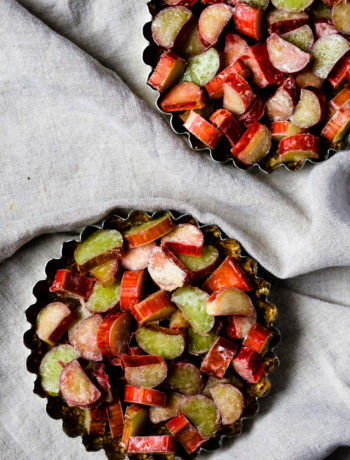 Ideally, store in the fridge for a couple of hours before eating. 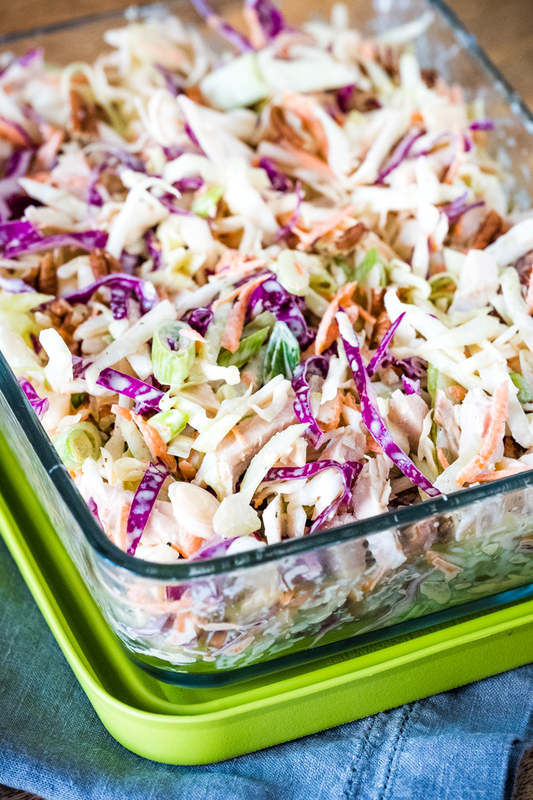 You can add cooked chicken to this salad or serve it as a side dish. I live to add more extra virgin olive oil when serving for extra Omega-3s.